What factors affect growth of Vibrios in oysters? Researchers at the University of New Hampshire (UNH) are studying two illness-causing species of bacteria found in oysters to obtain a more detailed understanding of microbial life on the half-shell. The research has revealed that oysters aren’t simply passive filter-feeders that contain the same bacteria as the water surrounding them. They each have a unique microbiome — the community of microbial organisms living within a certain area — that may be significantly different from one another and from their watery habitat. Two UNH associate professors of microbiology, Vaughn Cooper and Cheryl Whistler, are trying to determine how changes in water salinity and interactions between microbes in shellfish can potentially increase or decrease the likelihood of a pathogenic Vibrio outbreak from shellfish consumption in New England. The data will provide detailed information on the impacts of runoff and harvest area salinity, and improve the accuracy of forecasting models used by shellfish managers and public health officials to predict the potential for Vibrio outbreaks. The ultimate goal is to minimize risks to human health without having to close shellfish beds for long periods of time. 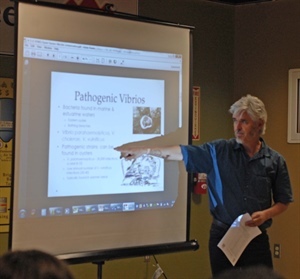 The project, funded by New Hampshire Sea Grant, focuses on Vibrio parahaemolyticus and V. vulnificus, both of which are found in New Hampshire’s Great Bay Estuary. This project builds on years of previous research and collaborative efforts that place UNH at the forefront of Vibrio research in New England. Not all Vibrio species and strains are pathogenic — in fact, the vast majority are harmless to humans and are found in most estuarine and marine environments throughout the world. But certain strains of these species can cause gastrointestinal distress for those who eat raw or undercooked shellfish. “There’s a combination of changes in the microbial community and changes in the salinity that alter the interactions between the microbes, so that’s what we’re trying to understand — how these interactions might favor the growth of Vibrios in oysters, increasing the likelihood of human infection,” she added. With the help of graduate students, Cooper and Whistler sampled oysters and water from Great Bay in 2012 and 2013, moving a subsample to a more saline portion of the estuary, while another subsample experienced heavy rains that caused a decrease in salinity. These samples are currently being analyzed by a state-of-the-art genetic sequencing machine at UNH. Once they determine the microbiomes of the oysters and the water samples, they can begin to look at the interactions that may be taking place to influence Vibrio populations. In addition to improving forecasting models, the data will also be added to their already established long-term Vibrio database and used as a reference as conditions change and to predict what’s going on in other locations where Vibrios are present or may emerge, Cooper said. 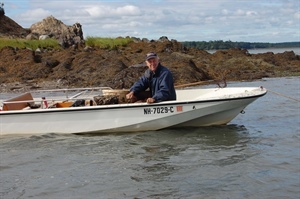 The changing conditions Cooper refers to are already showing up in New England waters, as pathogenic Vibrio outbreaks caused unprecedented shellfish bed closures during the summers of 2012 and 2013. Climate change broadens the growing period for pathogenic Vibrios that prefer warmer, fresher water. But Whistler noted that human behavior is also likely contributing to an increase in outbreaks. “There are more oyster farms providing a larger supply of fresh, local shellfish, and we’re eating more seafood now than we used to, especially in the warmer summer months — a time of the year when we used to avoid eating raw shellfish,” she said. Outreach and education about this topic are critical components to the project. Cooper and Whistler have collaborated with Steve Jones, New Hampshire Sea Grant associate director, and the non-profit organization Clean Air, Cool Planet to help spread the word to the public and oyster harvesters on ways they can minimize the risk of infection and pathogenic outbreak. Whistler cautions that if someone gets sick from Vibrio, it’s not necessarily the fault of oyster farming practices or climate change. “It’s a complex problem that needs more science to inform our decisions,” she added.